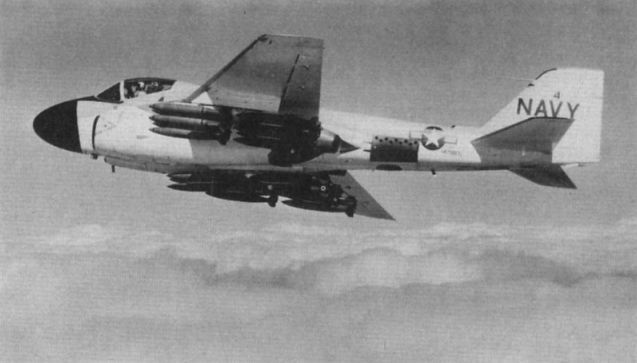 An A-6A of VA-115, the Chargers, based on the USS Midway. 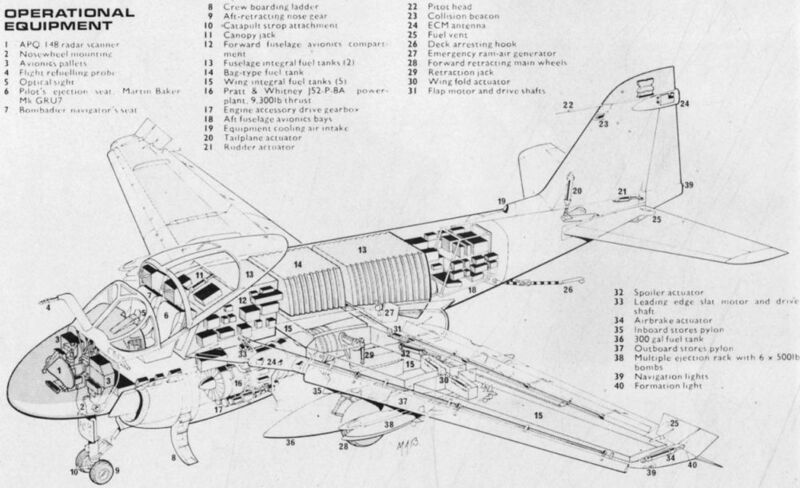 View of the first Intruder, 147864, when it was known as the Grumman A2F-1 and sported a long nose-probe for test flying. 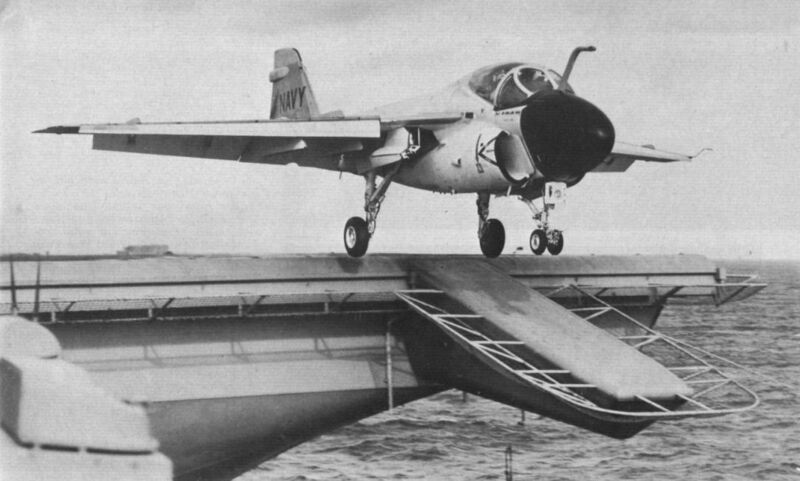 Picture shows an A-6A at the moment of take-off during early trials. 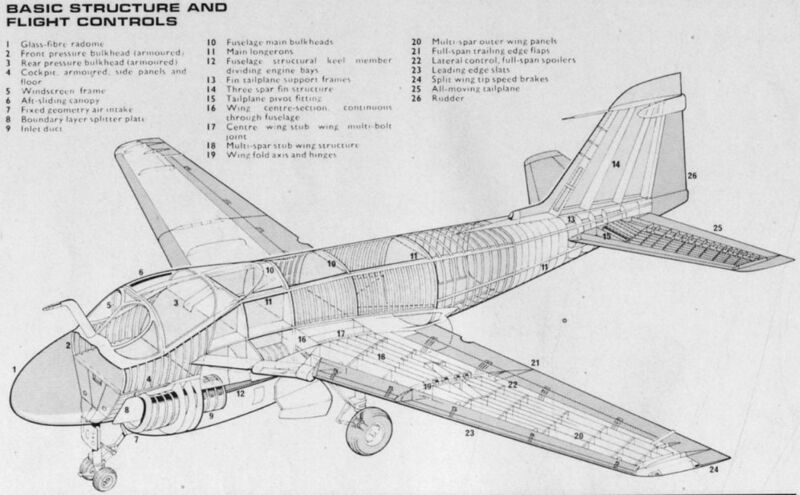 The last of the first four pre-production aircraft was 147867, seen here with a generous stock of underwing aggression in the form of 30 500lb bombs. 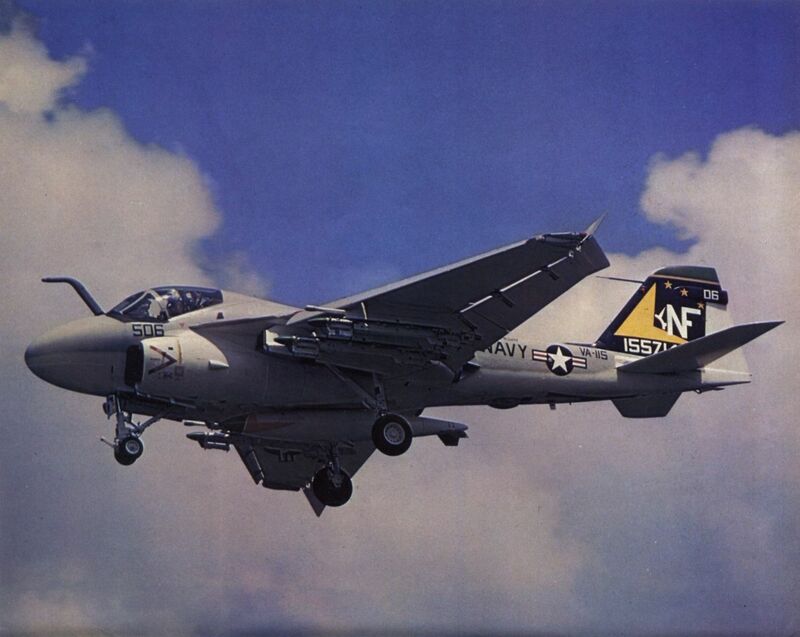 A-6E 155595 of VA-165, the Boomers, based aboard USS Constellation, began life as an A-6A. KA-6D tanker 151582 replenishes A-6A 151568 from its 3,000 gal supply. A-6E 154126, wearing the colours of VA-176, the Thunderbolts, flying from USS America, was previously an A-6A. 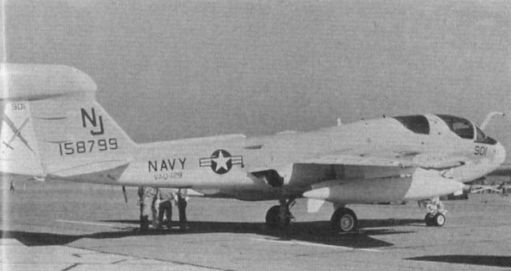 A fine shot of A-6E 158047 of VA-34, the Blue Blasters, about to touch down aboard the USS John F. Kennedy, with wing tip brakes in evidence. 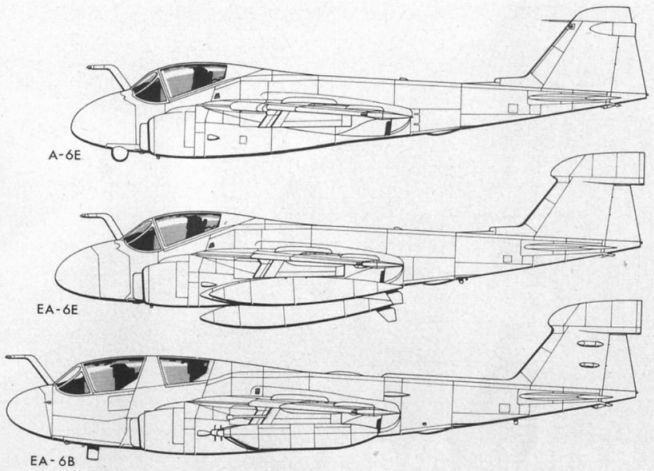 The second Intruder, 147865, is seen here, as an aerodynamic testbed for the EA-6A. EA-6B 158800 of Electronic Warfare Squadron VAQ 129, the New Vikings, at Whidbey Island. 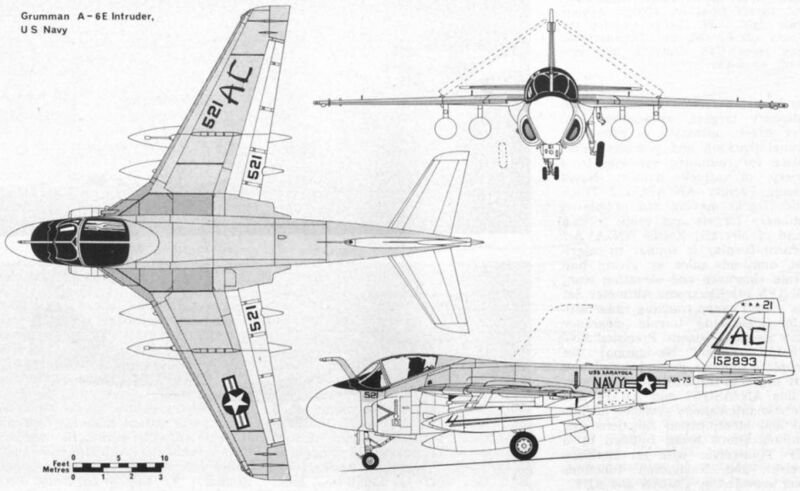 Originally an A-6E, 158799 is seen in service with VAQ-129 after conversion to an EA-6B. EA-6B 158039, serving with VAQ-131 aboard USS Enterprise, displays its wing-folding mechanism.